Will Client Hypervisors Drive Next Generation Desktop? A source of complexity for VDI is that, in order to deliver virtual desktops there needs to be an Infrastructure: unlike server virtualization, VDI can’t do away with end devices. Client hypervisors can allow for centralisation of management and resources, while utilising end devices’ compute power. In determining how to provide the next generation desktop – where can client hypervisors fit, what are the main options available and which steps need to be taken to introduce client hypervisors into your environment? Hyper-V is no longer just for servers; with Windows 8 Microsoft has brought Layer 1 Virtualization to the desktop. However with Windows Server 2012 they have also done a great job of putting Windows 8 into the virtual desktop infrastructure (VDI). In the first part of this session we will discuss VDI and the components necessary to build out a virtual desktop infrastructure and discuss many of the cool new features, such as multi-monitor VMs, touch interface, and pooled versus personal VMs. Once that is done we will discuss Remote Applications and publish them to our desktops so that the users can use the full power of the server for their applications! As the number of PCoIP zero clients increases in an organization, managing the endpoint devices from a centralized tool becomes essential. Teradici’s PCoIP Management Console helps IT Professionals save time and costs by providing the ability to centrally and remotely monitor, configure and update their entire ecosystem of PCoIP devices and proactively resolve problems. Are you interested in learning how to get the most of the PCoIP Management Console and fine tune your deployments? Are you interested in understanding about new management capabilities being added? Simon Bramfitt is the founder and principal analyst at Entelechy Associates where he covers application delivery, desktop management and virtualization technologies. He has over 25 years of experience in designing high-availability application delivery and virtualization environments in Europe, the Middle East, and the USA. Prior to founding Entelechy Associates, Mr. Bramfitt covered desktop virtualization at Burton Group and Gartner and was a senior architect at Kaiser Permanente. His experience also includes IT administration, consulting, service delivery and IT management. Mr. Bramfitt blogs at simonbramfitt.com. The way people work today has been transformed. Today’s users want access to enterprise IT services 24/7 from any location, and a traditional PC simply does not support this. However, to accommodate the flexible workstyles of mobile workers, IT is forced to come up with solutions for managing this increasingly complex environment. Workspace virtualization helps IT take on the challenges of mobility and security, while maintaining productivity across every line of business. In fact, workspace virtualization enables IT to centrally deliver, manage and secure the key elements of a user’s computing experience, independently of workstyles and devices. Karin is an Analyst with 451 Research's Infrastructure Computing for the Enterprise (ICE) practice. With a key focus on workspace virtualization, Karin also specializes in systems management in distributed desktop environments. Karin's IT industry experience began in 1997 as a research and administrative assistant in Merrill Lynch's Palo Alto technology investment banking office. Sean has spent the greater part of the past 20 years evangelizing and working across Citrix and Microsoft technologies. Prior to RES, Sean spent 5 years working at Microsoft in the System Center Alliance group managing the partners in the App-V ecosystem as well as the Citrix alliance. Sean came to Microsoft through the acquisition of Softricity in 2006. In his current role at RES Software Sean owns the strategic alliances programs and manages all ISV relationships including Citrix, Microsoft, VMware as well as Tier 2 ISVs. - Focus on career growth. See the Service Desk as an entry point, not a dead end, to your IT organization. Mark Smiley is ITIL® & HDI certified with over a decade of ITSM and Service Desk experience. He's worked with various clients and industries from around the world, including the government, healthcare, and education sectors, ranging from 5,000 to 400,000 users. Most recently, he has assisted in the establishment and development of three Service Desks, in addition to directly managing teams dedicated to customer support. He currently is working as a senior advisor to the United States Marine Corps as they establish their own Service Desk to support their day to day operations. Recently highlighted as being one of the top 5 threats for 2013 by the ISF, this webinar maps out how you can respond to the ‘consumerisation’ challenge today – whatever stage you are at – based on current efforts to formulate good practice at leading ISF Member organisations around the world. It offers independent guidance on how to plan your security response not only in terms of how your people use mobile devices, but also in terms of protection solutions, provisioning and support, and meeting statutory requirements. Steve Durbin is Global Vice President of the Information Security Forum (ISF). He is a regular speaker and chair at global events and is quoted in the Financial Times, Wall Street Journal, Forbes, Deutsche Presse, Süddeutsche Zeitlung, CIO Forum, ZD Net, and Information Week. Steve has considerable experience working in the technology and telecoms markets and was previously senior vice president at Gartner. He is also currently chairman of the Digiworld Institute senior executive forum in the UK, a think tank comprised of Telecoms, Media and IT leaders and regulators. BYOD is no longer a consideration, it’s a reality. Every day over 2 million new wireless devices are being activated and these devices will show up on you network. And while most wireless vendors are talking about the potential security risks, which are considerable, almost no one is discussing the impact the sheer numbers of devices will have on your networks performance. A recent Gartner study did and stated that ‘By 2015, 80% of newly installed wireless networks will be obsolete because of a lack of proper planning’. Many administrators still designing for coverage, when capacity limits are the true Achilles heel of wireless deployments. This session will discuss the varied client types and their capabilities, best practices to address growing device densities and how both impact overall network performance. IT administrator looking at a BYOD deployment or even just a wireless upgrade will gain valuable insight from this presentation. Perry Correll is a Senior Technologist as well as the Director of Product Marketing at Xirrus. His extensive networking background extends from original Ethernet Thicknet technology, through the switching revolution and now is involved in pushing advancements in Wi-Fi technology to displace wired solutions. Previous roles included technologist and management roles at Cabletron, Xylan and Alcatel. You’ve implemented the ITIL Incident and Problem Management processes but have run into one or more roadblocks. • Technical SME’s see the Problem process as overhead and “just a paper exercise”. • How Do We Find Root Cause? • How Do We Work With Vendors to Get to Root Cause? Join Paula Hero of itSMF USA as she shares the roadblocks she experienced in her organization and the lessons learned and practical suggestions for removing barriers and making the processes produce solid results. Often times we experience availability incidents. These incidents hold a different service level than those incidents caused by connectivity incidents. So what next? Join Rich Pilgrim, an experienced IT professional with over 20 years in the ITSM field, as he discusses the categorization of incidents and how they affect your SLA's, the link between incidents and problems and who should be looking at your SLA's for better service delivery. Data is what underpins many companies' success, yet when it comes to protecting it, companies are underinvesting in security capabilities. With the move to cloud computing, data security issues are not going away, instead are getting bigger visibility. However, should companies only care about data security when their data is in the Cloud? Or should it be irrelevant where it is processed or stored, with data security high on CIOs agenda? This session will look both at strategic options and discuss people, processes and technologies that companies should be considering. Vladimir is an expert in cloud computing and a highly qualified independent security professional. He has over 16 years of IT industry experience and over 12 years in information security and security, risk and compliance. Vladimir has both led and managed global teams in security, risk and compliance for multinational corporations. Utilising this experience, he has successfully constructed and implemented diverse Security, Risk and Compliance architectures, policies and strategies, by using accepted international standards. Lately he has setup an independent security management consulting practice. Vladimir is a major force and influencer in the newly established UK chapter of the Cloud Security Alliance, where he has the role of the Director of Research. Jeff Parillo, Managing Director, North American Sales & Ryan, Ahlers, Director, Sales Engineering , Aternity, Inc. Desktop Virtualization is the top cloud-based technology impacting End User Computing. And, user-centric, Service Level Agreement (SLA) Management is the primary factor against which cloud-based virtual desktop solutions and providers are and will be evaluated. If you are currently evaluating, planning, or managing application performance in a Virtualized Desktop Environment, don't let your VDI project get derailed by poor end user experience. A virtual desktop is a common goal. The functional requirement of that goal – an experience as good as or better than a physical desktop for both the user and the administrator. How do you achieve that? In a growing environment of “consumerization of IT” how do you ensure that the delivery of your virtual desktop service is easy to use, effective, and reliable? How does, how will, your virtual desktop environment score as you take 12 steps to a better virtualized desktop service? “Human factor” is often cited as one of the weakest links in the security architecture of web and mobile applications. With the proliferation of apps and the rise of a digital identity, users find it difficult to manage their passwords. As a consequence, many users resort to a simple but insecure practice of re-using one password across all applications and all platforms. Enforcing complex or frequently changing passwords exacerbates the issue. Besides being an annoyance to the users, it does not significantly improve identity assurance for secure login practices. As an ASP or an enterprise what can you do to protect your users or customers without adding too much complexity to their online experience? An optimal solution is always a compromise between usability, security, and cost. Join the experts from VASCO Data Security to learn more about the role of two-factor authentication in this paradigm. We will discuss how your organization can become one of the pioneers in bringing convenience and security to online account access. With hundreds of cloud applications and portals hacked monthly, millions of passwords and confidential records get into the hands of cyber fraudsters. The cost of fixing the consequences of these hacks can be enormous. Factor in the reputational damage and you get the picture. You clearly don’t want your application or portal to be on this list. What can you do to protect your users without adding too much complexity to their online experience? Whether you are in the B2B or B2C business or running an employee internal portal, this dilemma is almost as old as the Internet itself. Low security is considered one of the key obstacles to the adoption of cloud applications. But now you can become one of the pioneers in bringing convenience and security to online account access with strong authentication. To learn how, join our strong authentication experts for an educational webinar. In this talk we will discuss the role that data encryption plays on a computer hard-drive and in particular the impact that this has on the ability to perform computer forensics. The PC has been a device that has been adopted by both the consumer and corporate markets - but is it now dead? As CTOs look to plan for the next generation how do, and must they deliver services to accommodate generation Y's demand for tablet and smartphone connectivity? Must traditional PC deployments be replaced with virtualised desktops and applications hosted in the cloud? How does each desktop virtualisation technology fit into an enterprise desktop strategy - and is there a single vendor that offers a complete and wholly encompassing solution? In order to help you make a decision - what factors do you need to consider for your users and application estate. What are the requirements for applications performance and end-user experience management in Terminal Services/RDS and desktop Virtualization Environments? As organisations look to move to these solutions. Is the old problem of measuring applications performance and end user experience for Citrix XenApp (MetaFrame/Presentation Server), and Microsoft Remote Desktop Services/Terminal Services related to the new problem of measuring applications performance and end user experience for desktop virtualization solutions from vendors such as Citrix, Ericom, Quest and VMware? The mobile enterprise requires mobile desktops. By moving virtual desktops to a cloud-hosted service model, instead of an internally deployed and managed data center, companies can realize all the promised benefits of desktop virtualization—centralized management, improved data security and simplified deployment— without the costs or hassles of onsite virtual desktop infrastructure (VDI). Now users can use any mobile device they desire such as iPads, Android Tablets, or Google Chromebooks and still have complete access to their Windows desktop. This webinar will explore the reasons for changing traditional desktop computing strategies, why cloud-hosted virtual desktops are a compelling solution for many businesses, and how to leverage cloud-hosted desktops for Windows 7 migrations, mobile and departmental workers, and disaster recovery scenarios. Subscribe to this channel to find out current trends and continuing education for desktop support professionals. This channel will include webinars on usage management, diagnostics, monitoring, mobile devices, cloud computing and more. 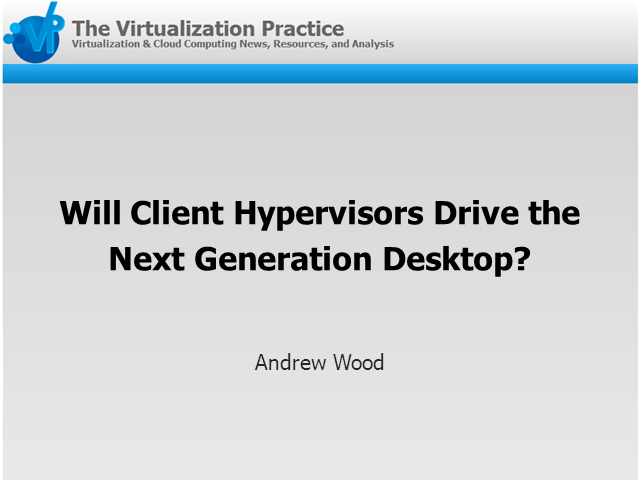 Title: Will Client Hypervisors Drive Next Generation Desktop?